*On Wednesday basketball great and business mogul Magic Johnson was in Chicago and was brought to tears in public. “I’ve been so blessed in life. I’m just trying to give back to the same community I grew up in,” said Johnson. Earvin “Magic” Johnson wiped away tears after hearing 18 year-old Haman Cross speak. “To open such a school in the Lawndale community, is a beacon of hope to the young student body and the community,” said Cross. Cross is currently attending the Magic Johnson Bridgescape Academy. Due to being homes chooled, Cross wasn’t able to earn a high school diploma. But that’s going to change thanks to the online course work Bridgescape is allowing him to take. After hearing Cross speak. Johnson offered him a four year scholarship for college. “Apparently he deemed me worthy and I have nothing but gratitude and appreciation for the hero and the inspiration that man is,” said Cross. 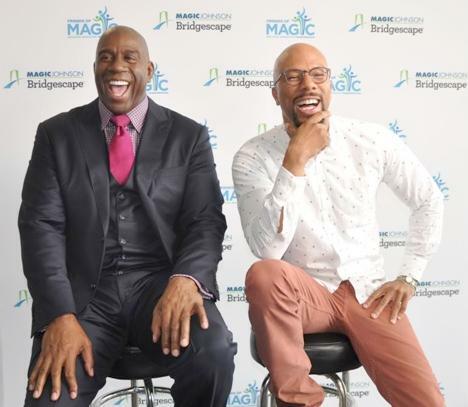 Johnson, with Governor Pat Quinn and Chicago rapper and actor Common by his side, has announced his new “Friends of Magic” organization. The goal is to help individuals sand businesses mentor young people or to assist drop outs to receive their high school diplomas with donations. “I have a daughter and I needed to be her role model. I don’t want anyone else to be her role model,” said student Tashay Young. “Everywhere I go, I’m asked, ‘What are you all going to do about the violence going on with Chicago youth?’ It’s through efforts like this that we’ll get our children off the streets,” said Common, whose mother, Mahalia Hines, a longtime Chicago Public Schools (CPS) educator and Board of Education appointee, sat in the front row. “I just want to make sure my time on this earth, I use it to affect change in urban America,” said Magic Johnson. Magic Johnson Bridgescape Academy partners with CPS to reach at risk young people. Right now, there are 17 academies around the country. Johnson says, by the end of this year, there will be 40 locations, nationwide. THANK YOU, MAGIC, COMMON AND COMPANY, AND ALL THOSE WHO REALLY CARE ABOUT CHICAGO. THEY PUT THEIR MONEY WHERE THEIR MOUTHS ARE.